The objective of Halma is to move all your pieces from your corner into the opposing corner. Each turn, a piece is moved to the adjacent square or, if possible, a piece can be moved by hopping over an adjacent piece into the hole the other side from where it can hop over another adjacent piece if such exists and so on. The game starts to get interesting when there are lots of pieces in the centre as a turn then will usually consist of a single piece making multiple hops over several pieces and moving some distance. To distinguish player, each pieces have different colors or shapes. If the game is only meant for two players (such as chess, checkers, mill, etc.) they usually have the colors white and black. But Halma pieces is colorful and the players can choose their favorite color. This time, we create something unique and unusual. Here is Spielstein Halma piece in giant shapes. Made from Teak wood that has dried and carved by our expert craftsman. 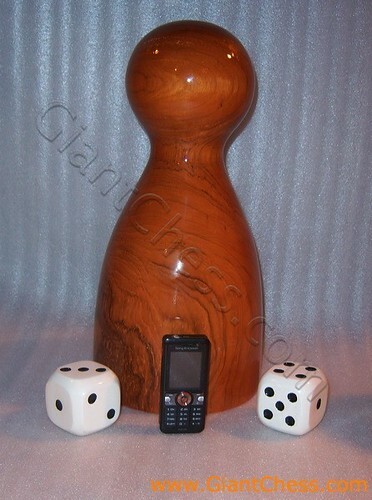 On the picture above we give you an example of our wooden giant Halma pieces in natural brown color. Get it now for your collection or your house decoration.